I love when I’m out early in the morning with my dog and I see something so simple that inspires me in a great way. 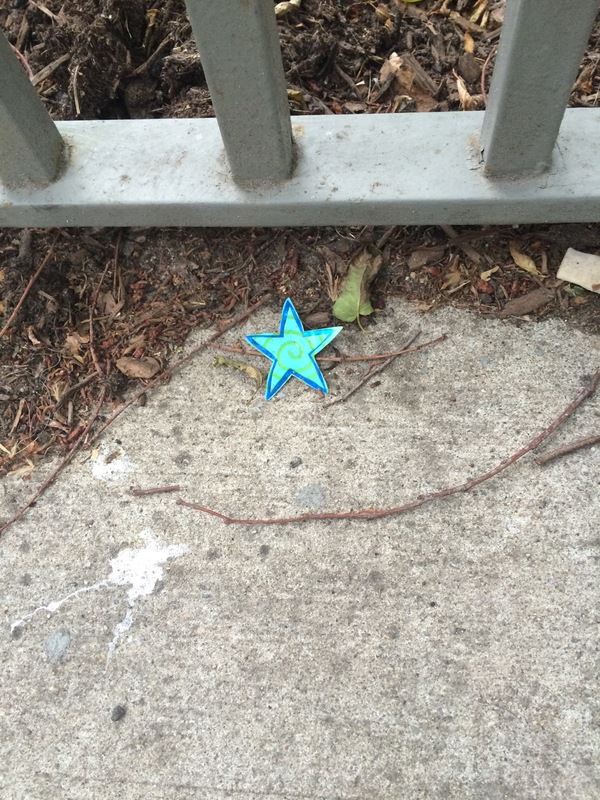 Seeing this sweet star just hanging out among the leaves and the cracked cement, had me thinking about people and their dreams and wishes. So many want to be stars, in the sense that they are recognized for greatness and hopefully have some positive impact in the world. The reality is that we are all stars. We all have the opportunity to shine, and we all have the opportunity to make someone’s wishes come true, even our own! It may be that your star doesn’t hang above the universe for everyone to see, but there are always people watching, so be a star. Be someone that others want to look at and be inspired by. Be that beacon that lets someone know they are heading in the right direction. When you are confronted with a troubling situation, shine your way through it and that light will reflect on everyone around you and inspire them to do the same the next time they encounter a similar situation. Sometimes being a star means taking a step back and letting someone else shine. Either way, we are all stars, we are all shining lights, we are all guides to someone, if not everyone. Be a star today, and let the world see you shine! The glow of the bronze from a Totem can be a constant reminder to shine. Get your Totem today by clicking on any of the Totems on the left.